June is Scoliosis Awareness month; here is what you can do. Please join us in bringing awareness to those with scoliosis that surgery is not the only option. Despite multiple studies have shown that over a 30 year period, scoliosis surgery adversely affected the quality of life scores when compared to those that chose to live well with scoliosis. The orthopedic insistence that surgery is the only option has handcuffed the families and patients into accepting a treatment they knew wasn’t the best option for them. Today things are changing. Thanks to our patients who spoke up and let people know of the their success. 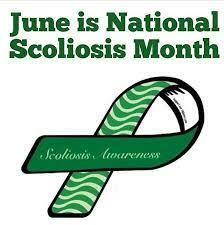 Use your personal social media platform this month to make people aware that scoliosis can be managed without surgery. Here are 3 things you can do to help. Together we can help people help themselves. Thank you for your involvement. This entry was posted in News and tagged scoliosis awareness month on May 30, 2018 by Marc Lamantia D.C..